Davis Paintball has lots of shaded and covered seating with picnic tables making it a great place to have a party or hangout with friends. The compressed air station fills both 3000psi and 4500psi. CO2 refills are also available. We also provide snacks and drinks for sale. Our most popular field amongst new players. You can see the enemy at the beginning of the game, but you can’t quite reach them. No surprise attacks on this field, as fire fights are done over long distances. Superior form and accuracy is what wins the game here. 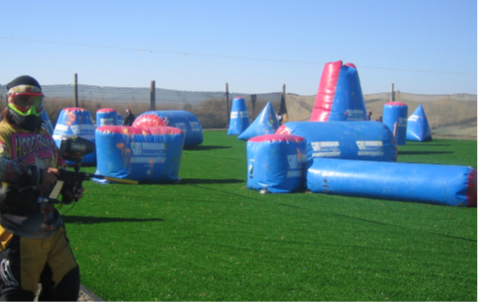 Davis Paintball’s newest field is dominated by a single building in the center and a tricky cross-work of low walls and buildings down one side of the field. Team work and a willingness to be daring is what turns the tide in this exciting field. Another one of our famous urban fields. Will your team win with sheer might and fire power, or will stealthy play prevail? Stalingrad can be defeated either way. Battle building-to-building, or send a few hidden attackers to secure the win. The large city structure in the center of Berlin means players must use the flanks to battle the enemy. This is urban combat at its finest. Battle building-to-building to lead your team to victory. This is where you prove your skills. The hyperball field requires quick thinking and reactions to be victorious. Bunkers are closer together, making the game a faster pace than our other fields. Do you have the skills to win? Airball is our most advanced field and is favorited by more experienced players. The close bunkers and tight angles creates a fast paced game where strategy and teamwork is needed in order to beat your opponent. Kingdom spans across 3 plus acres of playing space including a 1 plus acre citadel in the middle. The bold and fearless battle it out inside the citadel. However, if not enough people defend outside its walls, a quick defeat is sure to follow.